Time wave stuff like this under Harpers fat nose?!?!! Wow, it’s looking really bad. Surely, the fires will go out in the fall. I think. Will this still be the case in the future. I wonder sometimes just how much freedom the politician have to change policy, about the tar sands, for example. Some of them seem to be so beholding to the oil corporations that they cannot change policy without sacrificing their careers. Humans are too stupid to run planets, it seems. Hi Leland. Remind us, is taiga conflagration one of the major feedbacks in your estimation, or is lumped together with other forests or general burning of biomass. Here’s a link to a 2014 paper on triple point chimneys in the gas hydrates. Are all of these chimneys on the seismic scans these triple point chimneys, that pierce the entire depth of the deposit? I feel the same growing sense of horror I had when I started looking at all the circular features and lakes on the Yamal Penninsula, and started realizing that many of those lakes could have started as methane blowout craters. How many of them? All of them? Have we been staring at these things all along, and totally misinterpreting the meaning of these landscape features? Occam’s Razor says that one circular lake generating process operating in the same area is a simpler explanation than two or more processes. There are thousands and thousands of these circular lakes. How many are evidence of past methane blowouts? Now, we see these hydrate chimneys in the seismic scans, and see Smith and Liu and Flemmings interpreting them as triple poiint chimneys, that allow free migration of methane gas through the entire depth of the hydrate deposit. How many of these chimneys are triple point chimneys? All of them? Hi wili- I don’t actually know. Other people know more about this. Reasoning from first principles, though, I would say that in past slower hyperthermal events repeated burning of the taiga could have actually acted as a negative feedback. About 25 percent, if I recall right, of carbon in a normal forest fire can end up as charcoal, and repeated burning of the forests could have injected carbon as charcoal into the soil, where it can last for hundreds of years before it returns to the atmosphere. But, these are not normal forest fires- they are more intense – and they seem to be be adding to permafrost thaw. The northern permafrost contains something like 1.6 trillion tons of carbon – maybe twice the carbon content of the atmosphere. This permafrost carbon is a lot like fossil fuel carbon – it has been stored outside the active carbon cycle. 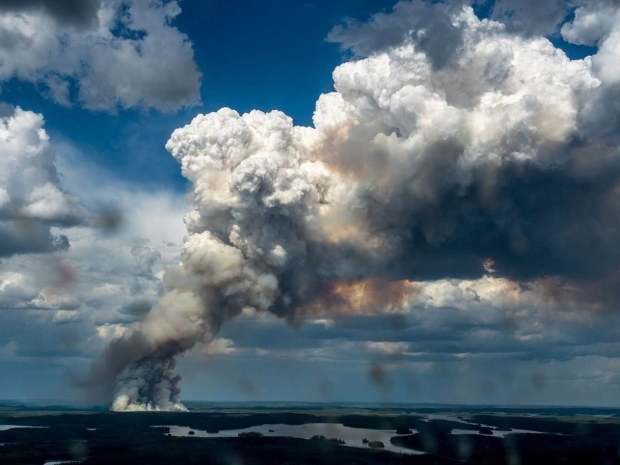 The fires could change the taiga from an immense carbon sink to a carbon source, increasing the effective greenhouse forcing of our fossil fuel emissions. The peat fires ignited by these forest fires could also release significant amounts of methane – a very strong greenhouse gas. And the soot from these fires could decrease the albedo of the Greenland ice sheet, increasing melting there. I’m afraid that the permafrost emissions could act as a bridge to the widespread destabilization of the oceanic methane hydrates. As Liu and Flemmings have discovered, there is a subclass of methane hydrates that contain high salt concentrations, and so are at the triple point of the methane hydrate system. The hydrates are also packed with gas chimneys at the triple point of the system, and we are just starting to realize that these triple point chimneys exist, let alone being able to predict how they will react to increased gas driven pumping of seawater or mud through the hydrate deposits.These triple point hydrates are in equilibrium with ocean temperatures and so can be extremely sensitive to temperature changes- so for these hydrates there will be no time lag between ocean heating and increased emissions of methane from these hydrates. Too fast – it’s all happening much too fast, I think. We’re in virgin territory. If it was a video game, it would be fascinating. To be clear about the hydrates – there is an energy barrier that acts to limit the rate of dissociation of the hydrates. Hydrate dissociation is an endothermic process that requires heat. Like ice, it takes heat to melt the hydrates. But now, we are supplying that heat, and it turns out the hydrate deposits are convoluted, and some of them are riddled with these triple point chimneys, which appear to act as free gas migration pathways, and may be susceptible to gas driven pumping, increasing heat flow into the hydrate deposits. I hate this crap. I want to wake up in a different world – one in which we haven’t screwed the biosphere. Sorry about the mixup in the order of the posts, above. Another great, but somewhat distressing article. And most of this is old-growth, too. Joe Biden once exclaimed after the ACA was signed into law: “This is a big f**king deal.” And although his comment was widely heard and discussed in the media, climate issues such as these are rarely mentioned in teh MSM. Even the Weather Channel makes little mention of the connection between current extremes and their causation. I expect to see a very distinct difference in what were fairly predictable yearly weather patterns now that we have upset the planets equilibrium. There’s a point where it interferes with accurate weather and situational forecasting. For example, a couple of weeks ago, the fire forecast was downplayed too much in a number of sources and they ended up flat wrong. The link between global warming and El Nino enhanced weather (particularly hydrological events) is being ignored for the most part in mainstream sources. So what happens when this El Nino finally becomes strong enough to crush the NEPAC block? All that heat and moisture exchange that was not predicted because the impact of all the added heat in the system was either ignored or not talked about? Well, you know what they say – What goes up, must come down. And the intensity of recent rain/flooding in the US only reminds me that with more heat, there’s more moisture loading and subsequent redistribution of this moisture [it’s not rocket science]. These fires are adding particulate matter to the mixture, too. Is there a connection here? Following the trail of the 2013 Sichuan flood in southwest China, researchers from Pacific Northwest National Laboratory and their collaborators found that heavy human-caused air pollution over the Sichuan Basin just upwind contributed to the catastrophic flood. Through a series of events they call “aerosol-enhanced conditional instability,” tiny particles from heavy air pollution absorb heat from the sun, stabilize the atmosphere, and suppress local storms during the daytime. However, this allows the heavy moist and now warm air to be transported downwind to mountainous areas where it is lifted causing extreme nighttime precipitation. The research was published in Geophysical Research Letters and highlighted by Nature. Robert, I’ve noticed that the local mainstream media (CBS,NBC, etc) “meteorologists” seem to be giving increasingly inaccurate forecasts. I realize they’re mostly talking heads whose meteorological forecasts involve pushing a button on a computer, but I’m suspecting that their basic computer models are no longer capable of handling the new dynamics that have been introduced into the system, and they need to be updated to accurately simulate current conditions. Their forecasts are often wrong just a day or two out, and they tend to underestimate precip potential fairly frequently. They’re using algorithms written for a 20th century climate, and we no longer live on that world. I often see them referring to the European model for major storms, which is far more accurate. Remember Sandy? They predicted her path with the left turn into NY/NJ about a week out while she was still in the Caribbean, while most US models didn’t fall in line until just a couple days before landfall. Also, the top link is to the OSPO site which provides the full suite of tools. A satellite image taken Tuesday, July 7. The green area is dust making its way across the Atlantic. South Florida’s air has been dustier than usual this week. The dust has come from across the Atlantic, originating from dust storms in the Sahara desert and being pushed towards the Americas by winds and tropical waves. While the current influx of dust-filled air may be a hazard for people with respiratory conditions, scientists say it also brings with it a more positive effect. …Officials began curbing the volume of water coming out of Shasta in late May, and the plan became official with an order signed late Tuesday by Thomas Howard, executive director of the State Water Resources Control Board. Keeping more water in Shasta through September is a key element of a plan aimed at cooling down the Sacramento River through the spawning season of winter-run Chinook salmon. Regulators are desperate to prevent a recurrence of last year, when the river got too warm and 95 percent of the juvenile salmon were wiped out. Environmentalists and the fishing industry weren’t rushing to embrace the decision, either. The plan would allow water temperatures to reach as high as 58 degrees, or 2 degrees above what is normally allowed. There’s no guarantee this year’s winter salmon run will be protected, said John McManus, executive director of the Golden Gate Salmon Association. “A new review analyzing three decades of research on the historic effects of melting polar ice sheets found that global sea levels have risen at least six meters, or about 20 feet, above present levels on multiple occasions over the past three million years. “What is most concerning, scientists say, is that amount of melting was caused by an increase of only 1-2 degrees (Celsius) in global mean temperatures. We are fast approaching the 1 C range now and may beat it for months of this year. Chris Mooney does a good job on back ground on this paper . Finally someone’s talking about paleoclimate. Good job, Chris. Spain also beginning to burn, unsurprising given the heat and drought. Yes, the methane hot spot over the Four Corners area of the Southwest U.S. is also over an area covered by thousands of fracking wells and associated gas processing facilities. Zooming in on Google Earth, thousands of them are visible. The wells are along dirt roads, and look like little dots or commas on a spider web of dirt roads. So, it seems reasonable that the Russians could have their own permanent hot spots as well. When fire frequency increases, habitats change and biodiversity usually tumbles. Under cloud cover dense enough to block long wave radiation there’s a bit of surface cooling. But overall, the impact of wildfire brown carbon emission as well as the related greenhouse gas emission (CO2+methane) makes this a net positive feedback. This may help with your question Phillip. Stick around , and watch. The nasty combustion products coming from these fires are going to start showing up on the sea ice and Greenland. As this season got under way the Canadian fire officials in the NWT, said that 6 of their fires had over wintered in the ground. One stump can burn 6 or 7 feet into the ground alll winter. We’re not just burning trees here, we’re burning “duff” as well , in some cases a foot thick. Think of it as the permafrost’s down jacket. Spruce needles moss, twigs , leaves etc. etc. And as RS pointed out we’re burning the bogs that dried out. The Muskeg . This whole system has flipped , these forests are not like the Rockies where fire is part of the dance. Lake core samples show much of this system hasn’t burned in 5,000 years. And that number is because the record stops at 5,000 years. Two years it was Russia on a much lager scale. And since then we’ve seen fires in Norway in the winter. It’s real floating campfire here riding with RS. 1 to 1.5 km wide calving event. Great catch G man ! Jason Box has a really excellent drone. Just wish there sounds of the event and commentary . That blue water that appears @ 5: 45 , is melt water from the base of the glacier. Once the plug failed it just gushed. In fact it’s pressure is probably why a 1 to 1.5 km wide calving event happened. The GRACE sats will catch this drop . As all that water left the system , the surface above will slope over the next year will slump. This is really a big deal . I’ve been watching the Jakobshavn for 10 years, this is a new state for the world’s fastest glacier. And still they lie and deny human-caused climate change. Great, thanks for this. will repost. On the subject of trauma, not only climate scientists but also other academics and activists like myself are experiencing deep paralyzing depression, in my case alternating with overwhelming grief. When several years ago (maybe five, maybe 7, I dont remember now)I woke in the night with a cold realization that we had gone past the point of no return, in my wildest dreams I didn’t imagine the overwhelming size of the denial and refusal to act that we are faced with today. My desire is to go back home, buy some land for my faraway family and bunker them all down (they sensibly refuse, of course) and I wonder why I remain here in North America futilely attempting to help effect change when even my university is so damned recalcitrant. Glad I found this incredibly informative and helpful blog. Thanks. “One of the purposes of this paper is to explain the severe forest fires by lightening in 2004 and 2005 that consumed 10% of the forest area of Alaska. Good idea, wili, will see if I can add that content later tonight. It’s a great context and one I really only touched on. Last year I remember asking if the light smoke cover that was present over New England could have contributed to a particularly intense lightning show that we had here. We had some discussion on the point. Interestingly, there was a storm that rolled through the northern burbs of DC last week (just when the current smoke was making it’s way to the area) and Twitter exploded with folks remarking on the extreme amount of lightning in the storm. Of course there were other atmospheric factors at play to produce such lightning but I wondered if the smoke played a role. If my math serves me correct 11,000,000 acres = 17,187.5 square miles or the area of 1.5 X the area of the whole state of Connecticut. It is not even the middle of July yet! I’m off by a decimal point. Oops. Everyone watch this , this not how glaciers make ice bergs . ice falls off the face , and a wave is pushed in to the outlet. This is a video of ice falling off a face, and fountain of melt water gushing from deep in the ice sheet. I always saw it as coming at the bottom of the glaciers. And we would never see it do this. I’ve always been a fan of Nova, and Robert Kurlwich, so I was watching 2 years ago when this Nova Science Now program first aired on the Jakobshavn Glacier. Kurlwich introduces the story by doing a little glacier 101 speed report. The clip is here and it’s 7 min. long . In the story , they report that around the year 2000 the Jakobshavn started to pick-up speed. It went from the “normal” speed of around less than 1 foot a day to 113 feet a day in 5 years. This was widely reported then, so it’s a pretty good benchmark. The program aired in July of 2005, so this morning I went looking to see what the Jakobshavn was doing 2 years later. Sure enough, the Washington Post ran a story on June 9, 2007 about the research being done on the glacier. And note all the grey om the ice , that’s soot. This looking into the abyss. Is a real drag. It’ll drive all of us crazy. I’ve been crazy for 45 years. Trust me , guts is what you want. Trust me , guts is what you want. Ones you never knew you had. Ones you never dreamed of. I live in the fog zone, an area of the pnw that has so much ocean created humidity that we usually don’t even get the fire ban that effect the rest of the coastal forest districts. The heating and effects experienced in the pnw in the last few years has been tremendous and the accumulated effect of no snow pack and radically different weather patterns has left things in a true state of disaster. The forest is so dry trees are blowing over in the summer breezes that come off the mountains, the powdery soil cannot hold the roots. Our ground water is virtually gone and wells run dry and a few of my acquaintances have now migrated to the city because they no longer have water to wash and drink. All our local major rivers are so shallow that you can walk across, some have stopped running all together. And the fish the ones that were unfortunate enough to try making it up steam before the latest heat wave are stuck in the few remaining deep pools at the intersections of streams that were once surging rivers. We’ve had weeks of temps in the upper 30’s and no rain of significant amounts since April. Through some miracle we haven’t had a local fire yet, but it truly is just amazing luck that we haven’t. Although our skies have been red with all the smoke from the other fires so far it is tainted only by distant catastrophic flame. It is only a matter of time though. I don’t have time now to go into detail on how much out glaciers have shrunk in the last few months or the variety of plants that have simply withered and died, but the changes here in coastal rainforest are apocalyptic in proportions. This may not be the safe haven that some experts thought it would be for weathering climate change. 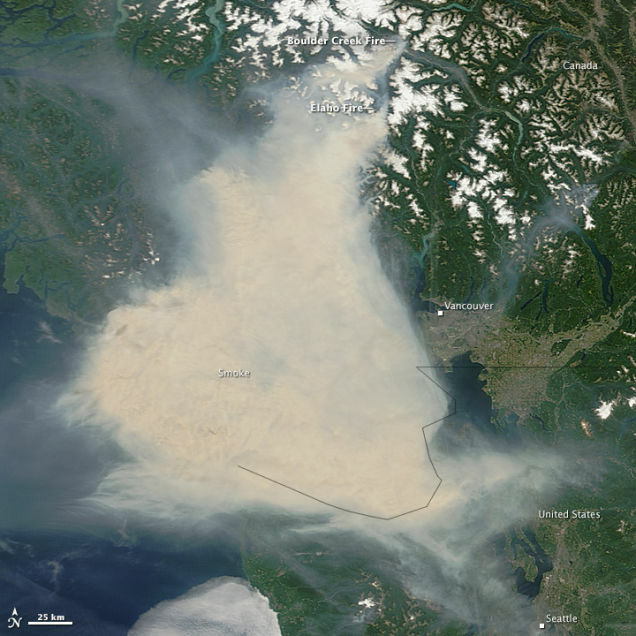 It looks more likely that we will be a coastal desert permanently blanketed in smoke and ash. It reminds me of Ballard’s burning world…. I am beyond hope, and scared shitless. realising that my families future is now likely to be that of a climate refugees…. Thanks for the realtime on the ground report from your area, Shochin. I’m sorry for what you’re experiencing. These days it seems like nobody is immune from the effects of AGW. They are happening with greater intensity and more frequency every passing season, and still the general public is completely oblivious to the major disaster that is affecting their lives and will only make their lives harder and harder as time goes on. A sad state of affairs. Under climate change, there is no safe haven worthy of the name. And no one gets out unscathed. Prayers are fine. But how about some actual, strong policy action to make the situation better?